In the early morning hours of Saturday, Nov 17, Arcata Police officers were dispatched to the 3400 block of West End Road to investigate a report of a male subject standing in the reporting party’s driveway with a flashlight and a rifle. The male subject, a stranger to the reporting party, watched her as she drove up to her driveway. Frightened, the reporting party drove away and called police. She was not injured. Officers contacted the male walking on West End Road approximately three minutes later. 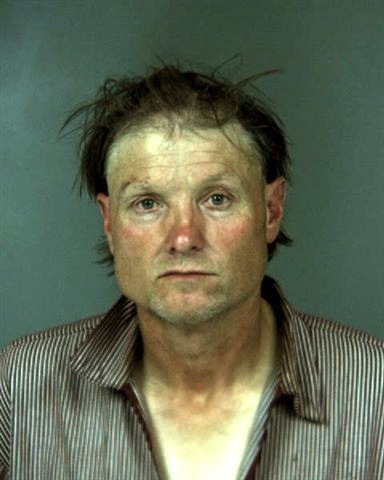 He was identified as John Paul McDonald, 49, of Arcata. He was in possession of a loaded, stolen rifle. McDonald made statements which led officers to believe he was under the influence of drugs. He does not currently live on or near West End Road, according to his California ID. McDonald was arrested without incident and booked into the Humboldt County Jail for P.C. 25850(a)-Possession of a loaded firearm in a public place and P.C. 496-Possession of stolen property. This entry was posted on Monday, November 19th, 2012 at 7:06 am	and is filed under News. You can follow any responses to this entry through the RSS 2.0 feed.